Hey Photographers! 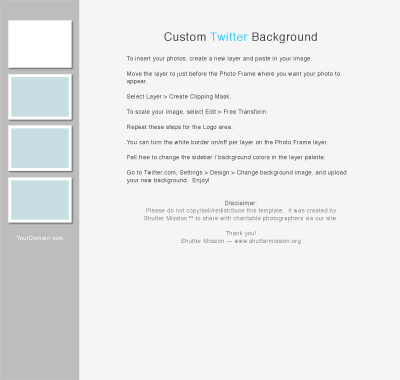 Ever want to create a custom background for your Twitter page, but didn’t quite know where to begin? Now you can whip up your own background image to match your biz brand and display your unique style of images. We used this same technique when creating our own Twitter background, and we are sharing our template with you! This template is super easy to customize — with just a few clicks you can insert your logo & photos, select background colors, and turn on/off shadows & borders. Instructions are included inside the file itself. Just turn off that layer before saving. The zipped PSD can be downloaded below. Note: This template was created in Adobe Photoshop CS4. Please share this post with your friends by using the social buttons below. If this template was helpful, hit us up in the comments with a link to your Twitter. We’d love to see how you put your own spin on the template, and we’d also love to connect with you! And while you’re here, be sure to check out our Directory of Portrait Charities and our growing Resources for Photographers section. Thank you, I can’t wait to try this out! You’re welcome, Christina! Glad you like it!